Morehouse College President William J. “Bill” Taggart died sudenly on June 7, 2017. ATLANTA, GA — The Atlanta University Center community and particularly the Morehouse College family are stunned following the sudden death of interim President William J. “Bill” Taggart Wednesday night. Taggart only officially took over the position in March following the early ouster of John S. Wilson three months before his contract expired at the end of June. The college had not release a statement concerning cause of death only one of condolences from the board of directors. One news outlet report that he suffered a brain aneurysm. 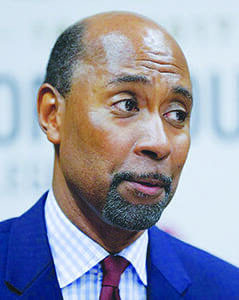 Taggart who has a long history with Morehouse managed the college’s day-to-day operations, according to a letter from Morehouse Board Chairman Robert Davidson. The Howard University alumnus and former president and CEO of Atlanta Life Financial Company joined the Morehouse administration in July 2015 as the campus’ chief operating officer, with executive oversight of the school’s fundraising operations. “I, along with the entire Board of Trustees, have the utmost confidence as he steps into his new role and leads Morehouse in the coming months,” Davidson wrote in a March letter to the college’s community.